Professor Margaret House, Vice-Chancellor of Leeds Trinity University, has been awarded an honorary degree by her previous university, Middlesex. Before becoming Vice Chancellor of Leeds Trinity in January 2013, Professor House worked at Middlesex for 26 years. She held a number of high-profile roles there, including Dean of Social Sciences, Dean of Health and Social Sciences, and finally, Deputy Vice-Chancellor, Academic. Professor House is also a leading figure in research into the management and monitoring of river water quality, and was responsible for the development of the House Index of Water Quality. Leeds Trinity University is one of the UK's newest universities, but has a lot to offer, as Professor House explains: "It's a small but very ambitious university, where working collaboratively is extremely important". 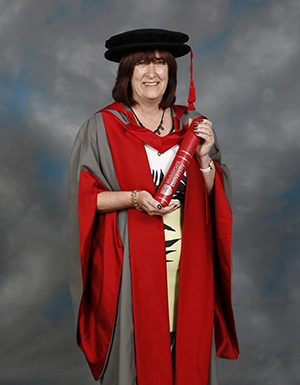 Professor House returned to Middlesex University to pick up her honorary degree, which was in recognition of her work for the University and in higher education more generally. Remembering her time at Middlesex, Professor House explained: "I've seen Middlesex grow, develop and expand its range. I've seen it change personality, and extend research strengths, as well as its international provision. "It is an honour to have the work I did at Middlesex recognised, and it will be great to see old colleagues and friends again." Middlesex University Vice-Chancellor Professor Michael Driscoll: "Professor House made a huge difference during her time at Middlesex, and played an integral part in making the University the success it is today. "We are honoured to call her a friend, and are so pleased to be able to give her this award."